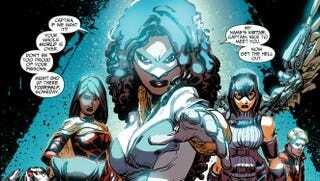 The Movement #1 - I was skeptical about The Movement at first back when DC comics announced it as part of a pair of new series focused on the fractious class and political divides in modern-day America. These could be comics that felt horribly out of touch if the execution stumbled. The first issue’s out and I can say that there are ingredients here that I like: crowd-sourced social justice that approximates how technology gets used in the real world and a cast of new characters that riff on the X-Men/Teen Titans/adolescent alienation template. But, Simone deals her protagonists an extremely easy hand by making their milieu fictional—which isn’t so weird since it’s DC and their comics generally don’t happen in real-world locales—and by making the cops and their political ecosystem seem totally reprehensible. From the little bit that we get in this first issue, Coral City makes Gotham seem like a paradise. First issues are tricky, since they have to sell a new series’ premise in a tightly compressed way. I generally like most of Gail Simone’s writing, particularly her deft hand at interpersonal dynamics and her skill sketching out her characters’ emotions. Freddie Williams III’s art can run hot or cold for me. I’m okay with the exaggerated faces and proportions that seem to be a hallmark of his style but the art here feels too drenched in ink. I’m not sure if that’s Williams, inker There’s enough here to make me want to read through the first story arc. Hawkeye #10 - This is the first issue of Hawkeye that I haven’t flat-out loved. It follows up on last issue’s switch in tone by introducing a character who’ll likely be a new nemesis for Clint Barton and Kate Bishop. Kavi—the hired killer introduced in this issue—is a mirror image of Clint Barton: a circus orphan who becomes a skilled marksman. And the more disturbing subtext is that Kazi’s emotional hollowness echoes Clint’s inability to make lasting emotional relationships with women. That stuff is all good but I was missing the lighter tonal aspects that have made Hawkeye a great read. Don’t get me wrong: this book is still one of the best in superhero comics today. But this new chapter will probably be bringing it to a really grim place for the next few issues. Superior Spiderman #9 - I haven’t been following this book month-to-month but this issue was heavily hyped as a big one that would piss people off. In it, Slott seemingly closes a significant plot thread that seemed to be the path back to the Spider-Man status quo. (The cover is a big hint.) There’s no doubt that Peter Parker will be back in the webbed costume—maybe even by the time that The Amazing Spider-Man 2 comes out in theaters—but the way back to that familiar ground might be a tad less predictable. What about you? What sequences or covers from this week's comics made your eyeballs happy? Share ‘em in the comments below.